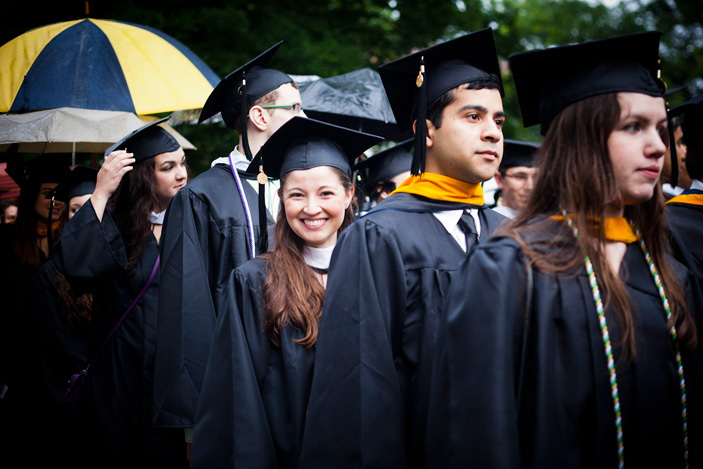 Emory held its Commencement ceremony for about 4,100 graduates on Monday, May 14 on the Quadrangle. 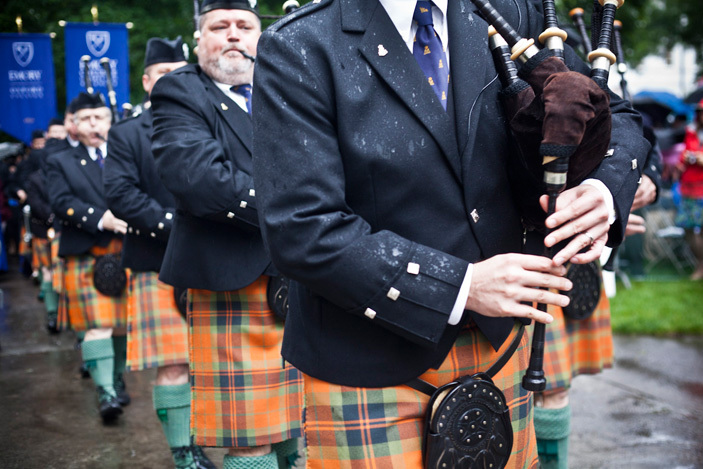 According to tradition, the ceremony begins precisely at 8 a.m., as the stirring sound of bagpipes and drums from the Atlanta Pipe Band herald the procession that brings faculty, graduates and dignitaries onto the Quad. Senior Louisa Cuervo makes her way through the processional. Graduates started the procession under a steady drizzle of rain, but severe weather held off for the rest of the day. 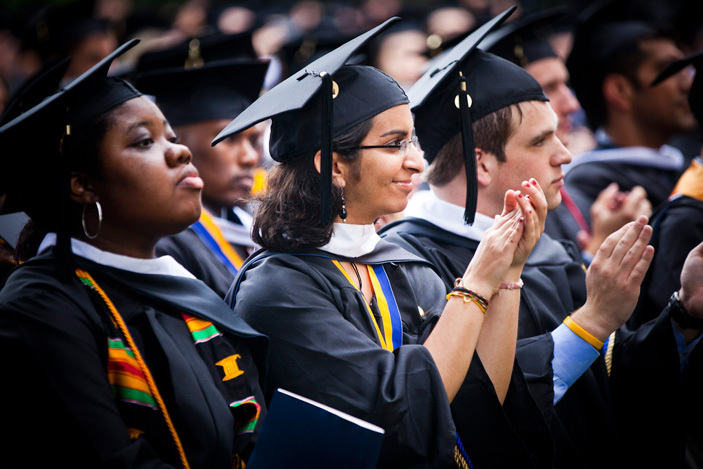 Emory University graduated approximately 4,207 students from the academic year 2011-12. Of those students, 71 received simultaneous degrees. Dana Toy and Tara Brooks find their names in the Commencement program. Of the graduates, 43.2 percent are male and 56.8 percent are female. 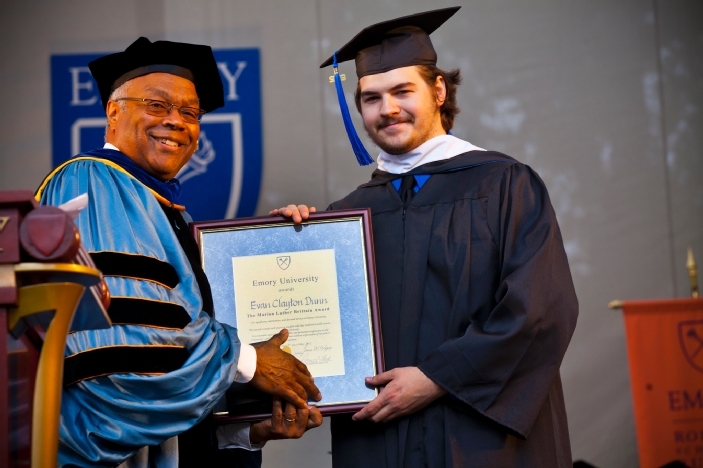 Evan Dunn is the 2012 recipient of the university's highest student honor, the Marion Luther Brittain Award, which is presented each year to a graduate who has demonstrated exemplary service to both the university and the greater community without expectation of recognition. 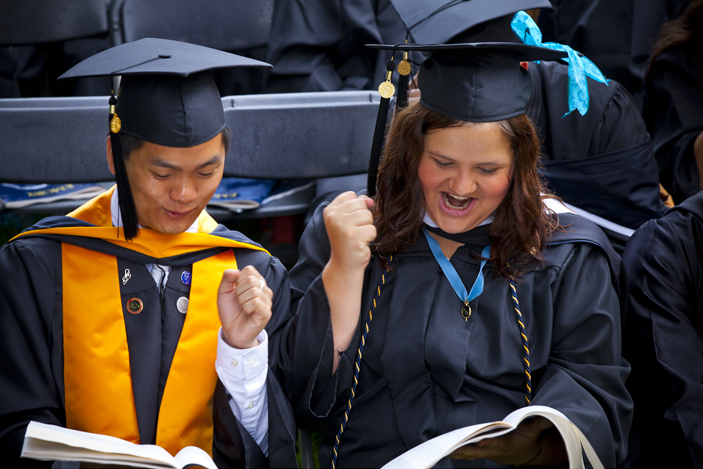 In Emory College of Arts and Sciences, 46.8 percent of the graduates have earned a cumulative grade point average of 3.5 or higher. 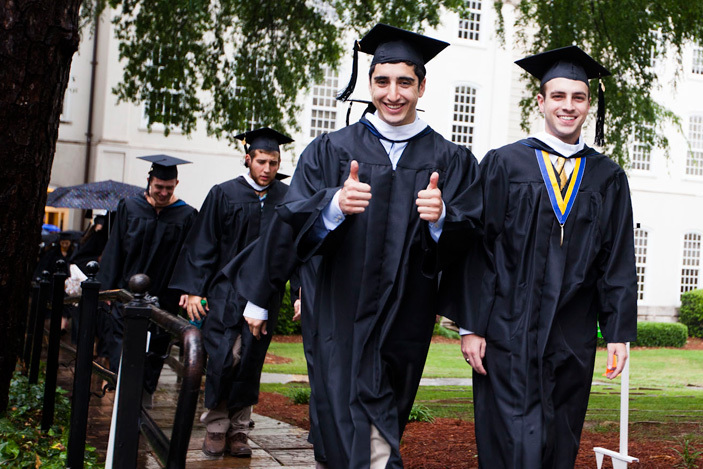 The average GPA of Emory College graduates is 3.38. 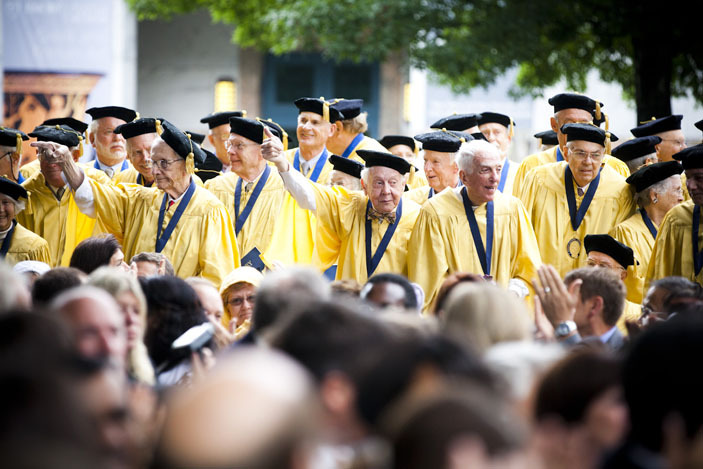 The Corpus Cordis Aureum — alumni celebrating their 50-year (or more) reunions this year — welcome the new graduates. 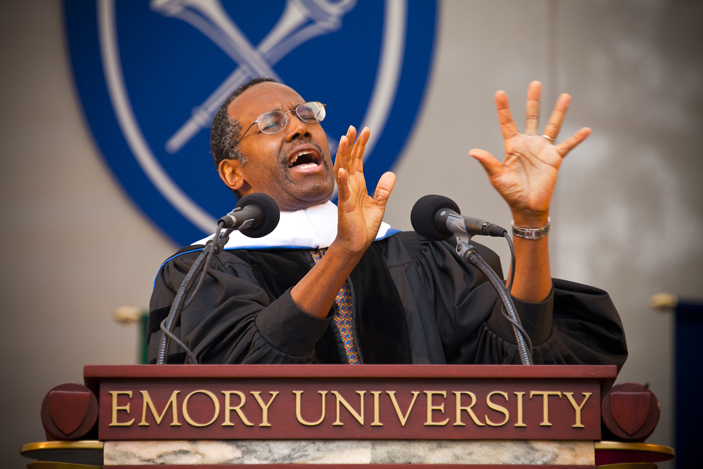 "And that's what true success is all about," keynote speaker Ben Carson, professor of neurosurgery, plastic surgery and pediatrics at the Johns Hopkins School of Medicine, said. "It is using the talent you have to elevate other people." 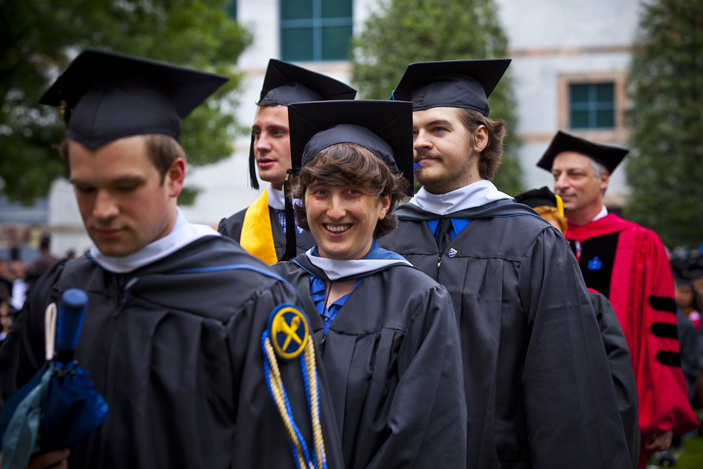 Emory held its Commencement ceremony for about 4,100 graduates on Monday, May 14 on the Quadrangle. Emory Photo/Video. Time-lapse video shows about 15,000 students, parents, family members, faculty and staff filling Emory's Quadrangle for the 167th Commencement ceremonies. 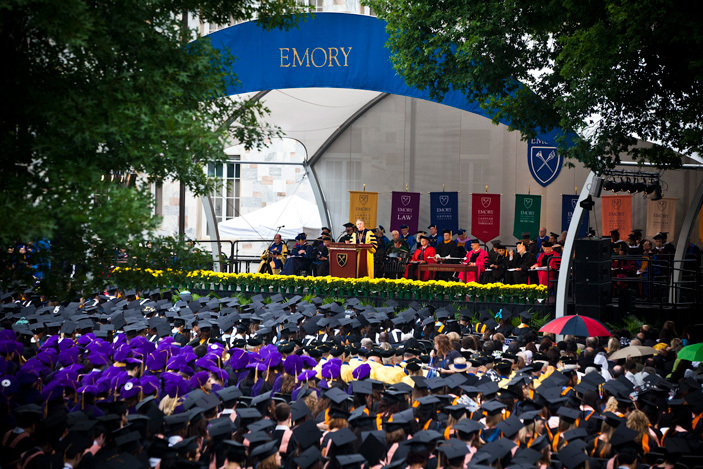 Despite sullen gray skies and a steady morning drizzle, it was with "undampened enthusiasm" that Emory President James Wagner welcomed guests to the University's 167th Commencement ceremony on Monday, May 14. The serene University Quadrangle was transformed into a vibrant patchwork of umbrellas and rain ponchos, as a jubilant crowd of about 15,000 students, families and supporters endured a long dose of precipitation — rare in recent campus history — to cheer the conferral of degrees. Clad in raingear, Fran and Dirwin Miller, of Scarsdale, N.Y., arrived early to get good seats to see their first grandchild, Jennifer Goldman, graduate with a degree in economics and Middle Eastern studies — weather was no obstacle to their delight. Emory alumna Carmen Collins, now a master's student in Rollins School of Public Health, and her aunts, Teresa Collins and Minnie Terry, arrived in the pre-dawn hours to stake out the best seats to hear physician and keynote speaker Benjamin Carson, who has been Carmen Collins' personal inspiration since the age of 10. Dodging raindrops, a smiling Laura Livingston posed briefly for her photo-happy father, Sam Livingston, of Long Island, N.Y. Her plans? Next stop, law school. And so the happy, damp morning unfolded for the Class of 2012, representing more than 4,100 students from all 50 U.S. states and 85 countries, distinguished both by its size — about 250 more graduates than last year's class —along with its resilience and optimism. Most of this year's graduating seniors began their studies at Emory amid one of the nation's sharpest economic downturns in recent history. "The U.S. economy and the world entered into what would become a new economic climate," Wagner observed. "You might have responded to that occasion — and it could be forgiven, I suppose — by drawing into yourselves, by looking after what is good for you alone," he said. "Instead, you found unusual resources of empathy with which you reached beyond yourselves, and thereby enriched your lives and those of others." As if on cue, the rain showers cleared as Wagner congratulated students for their hard work, noting the very qualities that set this group of graduates apart. "Each graduating class … seems to forge a distinctive identity for itself, and that is certainly true of you, this class," he explained. "You are a class of empathy, a class that has shown that you can achieve individual authenticity and exercise individual integrity by caring for others and for your community." To illustrate, Wagner spoke of the student-led development of a hardship fund for other Emory students and the collaboration between an Emory medical student and the Michael C. Carlos Museum to create a program that engages individuals in the early stages of Alzheimer's disease and dementia to foster expression, dialogue and memory. The Class of 2012 was also the first class at Emory to include graduates of the Master's in Development Practice program "that trains graduates to help create sustainable development in the face of global poverty, climate change, depletion of natural resources, and political and ethnic conflict," Wagner noted. Finally, he credited students for demonstrating "to the world the path to enlightened mutuality" by hosting an art gala that brought together both Muslim and Jewish students, along with those representing other faiths. The 2012 graduates "exemplified the urge toward and the successful achieving of a kind of empathy for which this world hungers so deeply," Wagner said, adding that he was proud the class has "demonstrated excellence with a soul." "There's a connotation in this that you have a special calling to look out for each other, to be responsible together," he said. "We have no doubt that you will carry your empathy into the community with you. In fact, this is something you must do — society needs that special combination of intellectual power of the mind and wisdom of the heart that you have developed and exercised here." The ceremony also marked the presentation of three university-wide honors for students and faculty: Emory senior Evan Dunn was presented the Marion Luther Brittain Award, the University's highest student award for service and leadership; Sarah Freeman, Betty Tigner Turner Clinical Professor of Nursing, earned the University Scholar/Teacher award; and Peggy Barlett, Goodrich C. White Professor of Anthropology, won the Thomas Jefferson Award. During the ceremony, five honorary degrees were also conferred, including an honorary doctor of humane letters degree to this year's keynote speaker, acclaimed neurosurgeon and humanitarian Benjamin Carson, professor of neurosurgery, plastic surgery and pediatrics at the Johns Hopkins School of Medicine. Reflecting upon his own early education — from an uninspired student to competitive scholastic achiever — he advised graduates to uphold their values and beliefs, to understand how they learn best, and to embrace the persistence necessary to achieve their own goals. Describing his groundbreaking work successfully separating twins joined at the head in South Africa in 1997, Carson said that beyond the medical challenge was a social challenge — the procedure was to be done at the Medical University of Southern Africa, the only major black teaching hospital in South Africa, and always the "step-child" to other medical programs during Apartheid. In part, his success is measured by the knowledge that those twins "this month will be graduating from the ninth grade." But success that day was also found in the utterly joyful reaction of the South Africans, "their chance to stand shoulder-to-shoulder with Cape Town, Johannesburg, and all the other universities." "They were literally dancing in the street, their level of self-esteem was so high," Carson recalled. "And that's what true success is all about," he added. "It is using the talent you have to elevate other people."